There are several paa or fortified villages in the Mangemangeroa Valley. They were occupied by the Ngai Tai people, the tangata whenua of this area, whose marae today is at Umupuia, east of Maraetai Beach. Ngai Tai and Ngatipaoa are descendants of those that arrived from Polynesia in the large waka, Tainui. Some local paa were probably occupied by Ngatipaoa centuries ago. The earliest arrivals from Polynesia were hunter-gatherers of the abundant seafood, birdlife and forest foods. As the population increased there was competition for food resources and fortified villages were built for their protection. The name Mangemangeroa refers to the fern Lycodium articulatum that grew high up trees. It is one of the world’s longest ferns. It was used by Maori as a rope to tie thatch onto whare [houses], fishing nets, around bodies before burial in the estuary and by Europeans as a mattress. There are very few mangemange in the valley today, but are plentiful in the Whitford hills, the Hunua and Waitakere Ranges. 1) The end of Pohutukawa Avenue above the Shelly Park Sandspit, now covered in suburban housing. 2) Near the Trig Station in Somerville Road. This was bulldozed by the farmer many years ago and destroyed. 3) On the ridge top in Broomfield’s Road, Turanga Paa, between the Mangemangeroa and Turanga River. This is now occupied by a large house and bulldozed. 5) Opposite the end of Hayley’s Lane road is Mangemangeroa Paa. This bush covered paa on a ridge above the Mangemangeroa Stream is well preserved and owned privately by a lady willing to sell to Auckland Council. Auckland Council should urgently buy this paa site as an added attraction to the Mangemangeroa Reserve. This is strongly supported by Ngai Tai iwi. Other paa in the area include Tuwakamana Paa at Cockle Bay, Ohuiarangi-Pigeon Mountain Paa in Pakuranga, Te Waiarohia Paa at Naupata Point[Musick Point], Paparoa Paa in Marine Parade, Waipaparoa [Howick Beach], Moukaraka [Flat Island] and Awakariki Paa[ near Whitford Landfill in Trigg Road]. 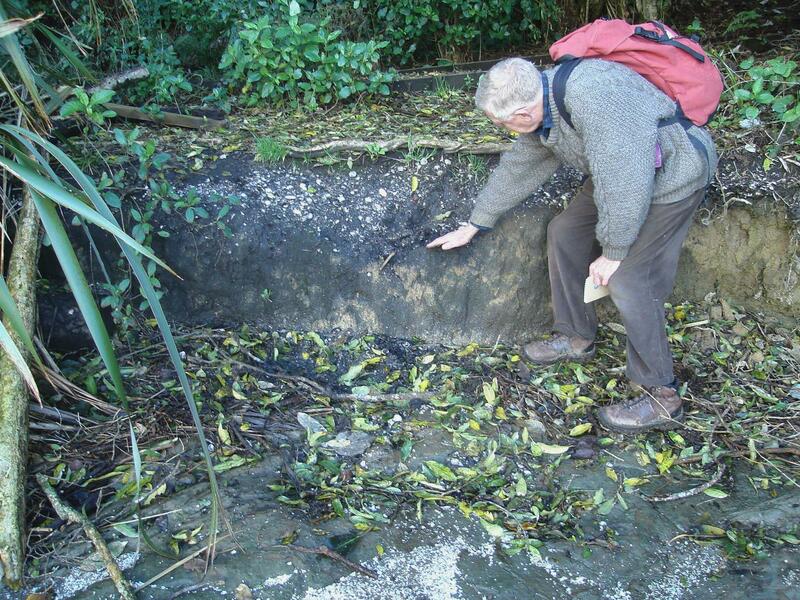 There is Maori midden with shell, hangi stones[ basalt rocks split by the heat of Maori earth ovens], charcoal from fires and other evidence of occupation throughout the valley on both sides. These valuable items of archaeological evidence should be preserved if possible. There are kumara pits in the higher sandstone cliffs of the Mangemangeroa Valley. 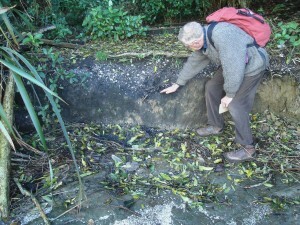 Several hangi are beside the estuary edge as clearly defined pits for cooking foods. When Maori lived in the valley there was substantial bush cover with kauri in the upper valley [above the Mangemangeroa concrete bridge of today]. Taraire, kahikatea, totara and kanuka also dominated the bush. In the forest there was probably plentiful kereru [pigeon], tui, bellbirds [Makomako] kiwi, weka, kaka, pukeko and small moa in the early years of occupation. There was also probably kakapo, kokako, saddlebacks, harriers and eagles. Oyster catchers, dotterels, and shags were plentiful on the estuary. Also on the estuary and ridges of the valley godwits and knots were plentiful as they congregated before migrating to Siberia and Alaska to breed each year. These were caught using branches of manuka, thrashing at flocks as they passed close overhead feeding on the different tides of the Manukau and Waitemata Harbours. Shell fish particularly tuanga[ New Zealand cockles], mussels, pipi and scollops appear in the middens. Fish were plentiful specially flounder, eels, dogfish, parore, mullet and schnapper. Pools towards the end of Broomfield Road were used by sharks, dogfish and hammer-heads, to breed where warmer water from a fault line made easier births in the late summer. Maori and later European farmers caught sharks here. There were eel [tuna] traps, vertical stakes in the nearby stream by Broomfields Reserve. On the estuary below Broomfields Reserve a ten minute walk towards the Turanga is the anchor stone of the Tainui waka. It is a silicified breccia of considerable geological and historical interest. It is about 1.5 metre round. There are stepping stones that were used to cross the Mangemangeroa Valley still visible when viewed from the lookout below “Archies Lookout”. These would have been used by Maori using the north facing slopes of Broomfields Road to grow especially kumara and other crops. They were stored in the kumara pits on the Somerville Road side high above the estuary. It is recorded by Harry Bushell an early settler that Maori living in the Mangemangeroa left in about 1870 for Waiheke as the European farmers took over. Maori were asked to either retire to the Umupuia Reserves or leave the area by the Government Commissioners settling the Fairburn Old Land Claim in about 1850. Some compensation will be made under the Treaty of Waitangi Settlement to Ngai Tai.